SAN FRANCISCO -- Justin Trudeau made his prime ministerial pitch to Silicon Valley on Thursday, and had a chance to push Toronto specifically as a place for Amazon's second headquarters during a private meeting with the company's chief executive. Before the meeting with Jeff Bezos, Trudeau said the project would be a boon for any city's local economy. He said he hoped Canada's largest city was the recipient of the expected US $5 billion project that could result in 50,000 jobs. The prime minister didn't say what his government was willing to offer to land the project, instead speaking of what he called the "Canadian advantage." "We know that investing in Canada is a smart thing to do in this global economy. We have access to markets around the world with the trade deals we're signing. We have an educated, diverse workforce that does incredibly great work," Trudeau said. "We're going to continue to demonstrate why we know that Canada is such a great place to invest. I'm going to continue to make that case to every business leader I meet, including Jeff Bezos." Trudeau's visit to San Francisco marked the first time in more than 70 years that a Canadian prime minister had come to the city, and his first in-person pitch to Silicon Valley. The goal wasn't to lure talent away from the region, but to sell Canada as a place to invest, said Rana Sarkar, Canada's consul general in San Francisco. "We are here not to steal jobs from Silicon Valley," Sarkar said in an interview this week. "We are here to co-create with the tech sector here." Two years ago when Trudeau took office, Canadian expats who were veterans of Silicon Valley talked to The Canadian Press about the difficult sell their home country faced. In California, salaries, sunshine as well as venture capital were all abundant, and the professional culture more advanced, they said. However, they also spoke longingly about bringing that culture back home to create the same kind of success in Canada that they experienced in California. "The valley is great, but it's actually not my number-one place where I'm trying to bring talent from," said Ben Zifkin, who runs a Toronto-based social network for businesses called Hubba. "It's hard to pull people out of that." Donald Trump's presidency has made the pitch a little easier: all the tough talk about trade deals and immigration has changed the political climate in the United States. Marc Benioff, the CEO of Salesforce, which provides customer-service cloud services to businesses, told Trudeau that "we connect with you on your values," particularly diversity and openness. "The political climate has obviously made Canada more attractive because we're more diverse, we're more welcoming and we're more open," said Lekan Olawoye, who leads the venture talent development division at the MaRS Discovery District in Toronto. Companies like Microsoft and Amazon have invested in staff in Canada to get around the American visa quotas for overseas workers, said Chris Sands, Director of the Center for Canadian Studies at Johns Hopkins University in Baltimore. "Canada has been a safety valve for these big companies that are able to bring people from Asia and elsewhere into Canada." 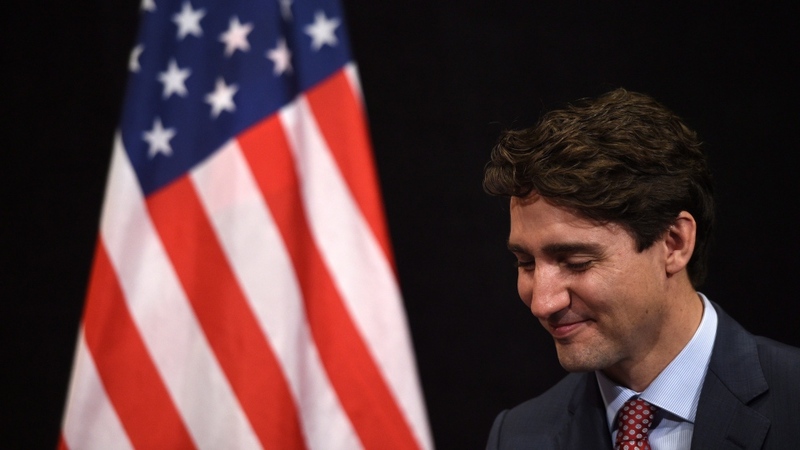 Trudeau said his government would continue to fast-track visas for skilled workers in the tech sector, because those companies want to bring more global talent to North America. "We know that bringing in great talent from around the world is a tremendous benefit, not just to the companies that want to do that, but to Canadian jobs and to our country as a whole -- so we're going to continue to do that."